There are a plethora of squash, so it is time to get inventive. I’ve never cared for squash puree, the disappointing younger brother to mashed potatoes. I prefer my squash to retain a bit of texture and to share the stage with other autumnal flavors: Sage, leek, and smoky bacon. Heat a skillet over medium low heat, toss the oats in and toast gently until lightly browned and fragrant, 10-15 minutes. Put in a food processor and pulse until finely ground. Allow the oats to cool. Add flour, salt and butter, pulse in the food processor until the texture resembles coarse cornmeal, with a few larger bits of butter still visible. Gradually add water and pulse until dough forms. Turn out onto a floured work surface, roll to 1/2″ thick, fold in thirds, wrap in plastic, and chill in fridge for 1/2 hour. 4 oz. good goat cheese, crumbled. In a large pan, brown the bacon over medium heat, remove to paper towels to drain, pour off all but 1 or 2 tbsp of the dripping. Return the pan to the heat, add the leeks and garlic, saute until the leaks soften, 10 minutes or so. Place leek, bacon, squash, and herbs in a bowl and toss thoroughly. Take the crust from the fridge. Roll out to a 15″ circle (you can neaten the edges if you choose, it’ll make for a cleaner looking galette. I left mine rough). Transfer to a parchment-lined cookie sheet. Brush the middle 12″ with the egg wash, saving some back. Mound the leek, bacon and squash mixture in the middle 12″ of crust. Scatter the goat cheese on top of it. Fold the outer edge of the crust over the filling, pinching the creases lightly to hold it together. Brush the crust with the remaining egg wash.
Bake until the squash is soft and the cheese is browned and melted, 1 hour. Cool for 5 minutes, then slice and serve. I’ve got a raspberry patch in my yard. In late June, early July, and again in October, I get a gallon or two of raspberries. One of my favorite things to make is this tart. The toasted walnuts compliment the raspberries wonderfully. 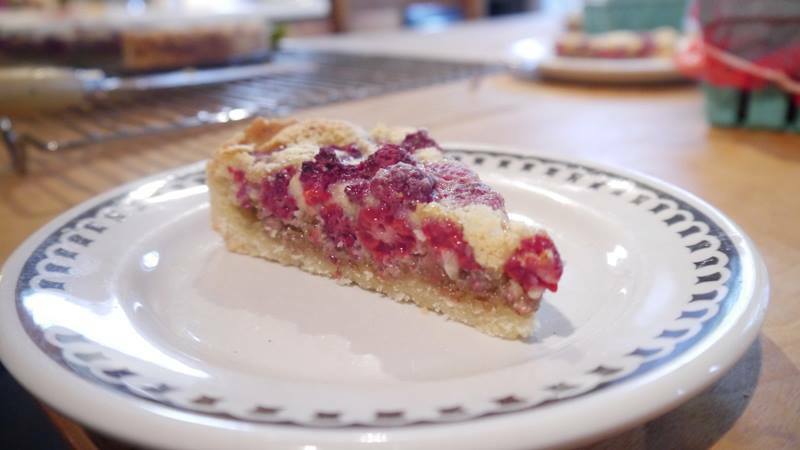 As an added bonus, the tart works as well with frozen raspberries as with fresh, so you can make this one in winter, as a Thanksgiving or Christmas dessert. 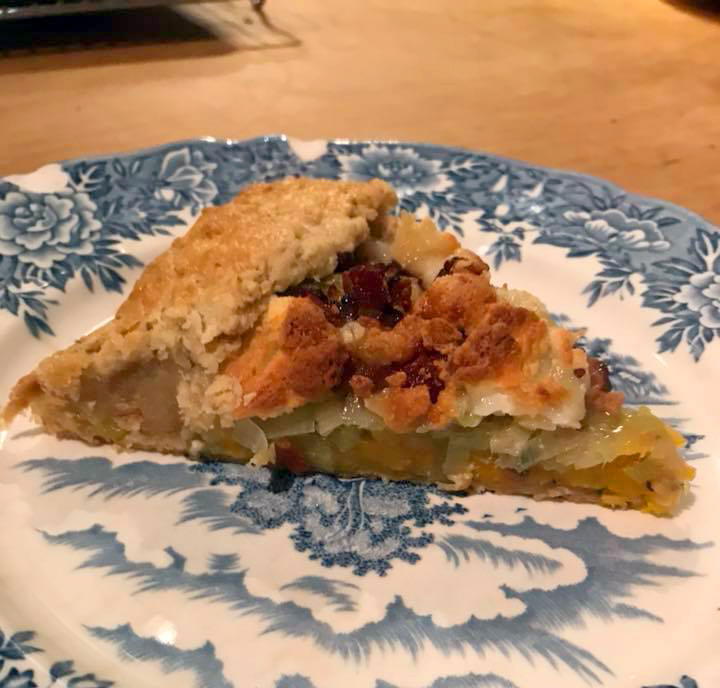 I call this “Tart Alma” since my friend, author Alma Alexander, flew from the west coast to Vermont solely so I could make her this tart. Make the crust. Preheat oven to 350 degrees. Place all of the ingredients in a food processor and pulse until a dough forms (it’ll be crumbly, but don’t bother adding any additional liquid). 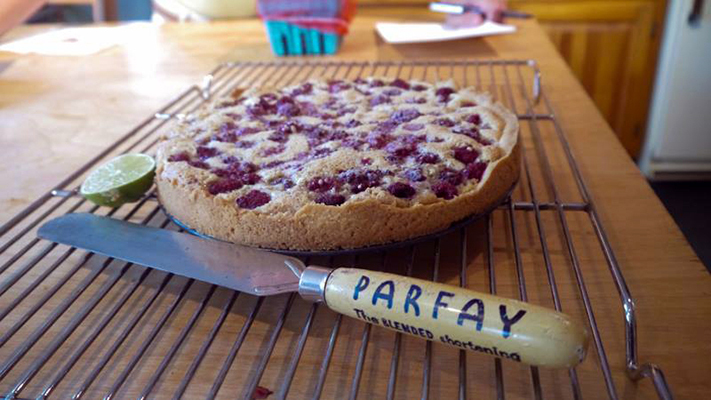 Cut a round of parchment to fit in the bottom of a 10″ tart pan. Tip the crust into the pan and press it flat, evenly, over the pan. I find using a flat-bottomed glass works well, but fingers are fine. Be sure to press the crust into the edges of the pan. When the crust is flat, place it in the freezer and let it set for 30 minutes to an hour. 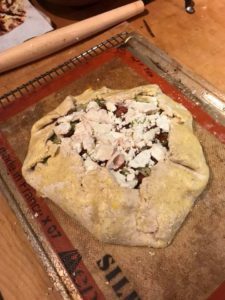 Take the crust out of the freezer, line it with foil, add pie weights (or dried beans, or rice) and bake at 350 for 20 minutes. Remove the weights and bake until lightly brown, another 5-10 minutes. Remove to a cooling rack. Prep the Filling: While the pie is baking, toast the walnuts in a heavy skillet over medium-low heat, shaking frequently, until fragrant. Keep an eye on them so they don’t burn. Remove from the heat. Beat together the eggs, sugar, flour, powder, salt, and vanilla. Assembling the tart: Scatter the walnuts over the crust. Scatter the raspberries on top of the walnuts. Pour the egg mixture over the raspberries and nuts. Bake the tart for 40 minutes, until the top is slightly browned. The center should still jiggle just a little. Remove to a cooling rack. Take a sharp knife and work it around the edge of the tart to loosen it from the pan. This will make it easier to remove from the pan when the tart is cool (I use a two-piece tart pan, so I can lift the tart out of the pan and slide it onto a serving platter, which I recommend).